Highly experienced small animal only vets. Modern equipment and extensive facilities. Full range of treatments from health checks to emergency operations. Complete convenience, open 6 days a week and 24hours on call. Plenty of easily accessible parking on site. 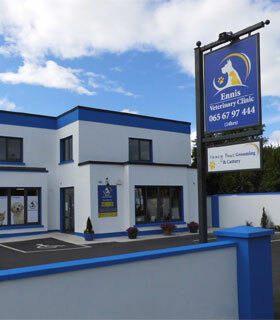 Ennis Veterinary Clinic is a small animal only clinic providing compassionate care for the pets of Co Clare. Our staff are committed to providing preventative health care, but should your pet need treatment, we offer the very latest and up to date diagnostic and treatment options. We understand that your pet is like family, and we will aim to always treat your pet with gentle, loving and stress-free care. You can be confident that your pet is receiving the best care possible from our highly trained and experienced team. We take time to explain healthcare recommendations, disease investigation and treatment options, and to find a treatment plan that suits you and your pet’s individual circumstances. We are located on the Clon Road, Ennis, and we are easily accessible with plenty of parking to make your visit to us as convenient as possible. Ennis Veterinary Clinic opened in July 2014, established by vets Dennis and Meghan Ryan BVMS. Our modern facility hosts two consultation rooms, a prep room and operating theatre, a diagnostic imaging suite for x-ray and ultrasound, advanced dentistry equipment including dental radiography, a separate dog and cat ward, and an isolation ward. Our pet only veterinary clinic means that your pet will receive the highest quality care from staff who are devoted to your pet’s well-being. We know that your pet is part of your family. We offer high quality veterinary care with compassion, empathy and service as our priorities. Dennis qualified from the University of Glasgow in 2005 and started work in London where he worked in a small animal only hospital until 2009. 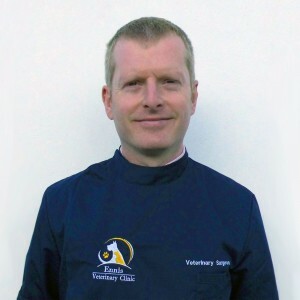 From 2009-10 he locumed in the UK and Ireland before taking up a full time position as head small animal vet in a Kildare practice from 2010-12. 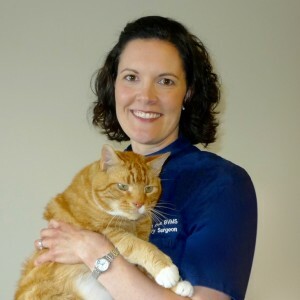 His main veterinary interests are small animal medicine, soft tissue surgery and diagnostic imaging. In his spare time he enjoys cycling, walking and spending time with his family. Meghan also qualified from the University of Glasgow, in 2002, which is where she and Dennis met. It was many years before the decision to open a clinic together was made however, and in this time Meghan worked in small animal hospitals in the UK, as well as the USA and Canada. Meghan’s love of veterinary medicine stems from early childhood when she developed a passion for caring for animals. Meghan has an interest in veterinary dentistry in addition to veterinary nutrition. She finds it hugely rewarding to see a patient develop a new lease for life after dental treatment and her desire is for every pet owner to brush their dog or cat’s teeth daily! Meghan and Dennis have three small children who are often seen ‘helping’ out in the clinic at the weekend, all who seem to be developing a familial love of animals. They have two cats, Ted and Dougal, who came from the UK back in 2008. At over 6kg each they are gentle giants, but they have rather naughty habit of running off with food stolen from the kitchen, which necessitates a lifelong diet! 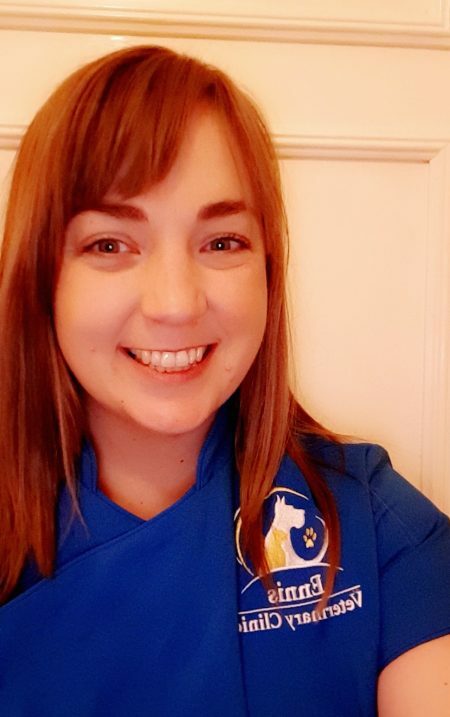 Sinéad graduated with a degree in Veterinary Nursing from Athlone Institute of Technology in 2015. 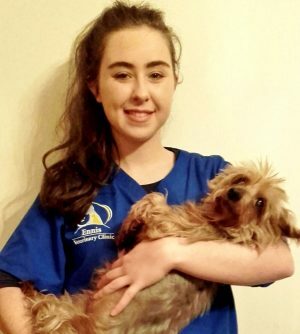 She worked in a busy small animal practice in Dublin before moving back to her hometown of Ennis to join our team. Sinéad loves all animals, from elephants to rats and everything in between! Her particular interest is in geriatric care and post operative nursing. She hopes to undertake further study in physiotherapy in the future. In her free time Sinéad enjoys fostering animals, baking, walking, hiking and travelling. She lives in Barefield with her 13 year old dog Shadow and her 19 year old cat Buttons. 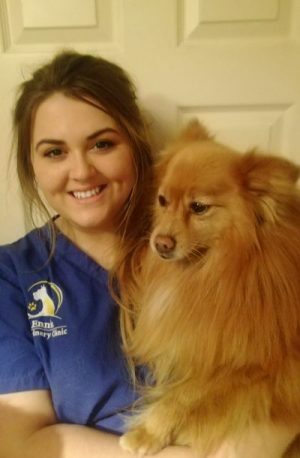 Tara’s love of animals led her to graduate from Letterkenny Institute of Technology in 2016 with a degree in Veterinary Nursing. She decided to further her studies in Letterkenny by completing a level 8 course in Animal Behaviour and Welfare. Because of this she has a deep interest in behavioural nursing as well as small animal weight management, nutrition and dermatological issues. Tara has always been surrounded by animals such as dogs, rabbits, hamsters, chickens and fish. She loves reading, cooking, art, movies, walking and spending time with her 15 year old Yorkshire terrier; Misty and 7 year old West-highland terrier, Shiloh. Katie has always been passionate about animals and knew since she was little that she wanted to help them and wouldn’t be happy doing anything else. She graduated from Letterkenny Institute of Technology in 2016. Katie hopes to specialise in animal behaviour one day. Her main interests are surgical nursing, dental nursing and puppy health checks. Katie lives in Limerick with her four dogs Mojo, Geisha, Dougie and Muggle, and her cat Peep. In her free time she likes walking her dogs, travelling, art and movies. Kate is from Ennis. She graduated from DIT in 2009 with a qualification in retail management. 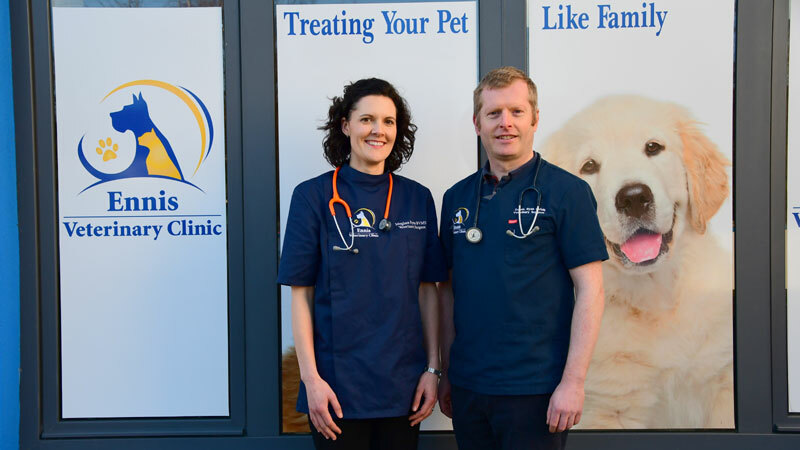 She spent 10 years working as a retail manager before starting in Ennis vet clinic. In her spare time she loves to go swimming, play tag rugby and travel.